Nozbe 2.0 and Nozbe 2.0 app for iPhone have just been released. Increased functionality and a new pricing model with gigabytes of storage in every plan, plus for the first time ever, unlimited projects and contexts in all paid plans. And I just love the new calendar in the web app and iPhone app. It makes it really simple to see what’s coming due, whether you’re at your computer, or on the go with iPhone. 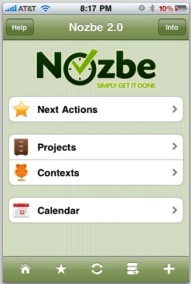 If you’ve never heard of Nozbe, or possibly GTD (Getting Things Done), now would be the perfect time to learn more. I just downloaded and installed Nozbe 2.0 for iPhone and it has all the bells and whistles of the web app, including the beautiful new context icons that everyone is talking about, and it’s only $2.99. That is an absolute steal compared to the other major GTD players out there, which run from $9.99 to $19.99. And for a very limited time you can get a 60-day money back guarantee, AND a great discount on a Nozbe account! Use the coupon code “UNLIMITED” for 15% off any prepaid plan, but hurry as this offer expires on Friday, May 14th. Start getting things done with the best multiplatform GTD app available, now with unlimited projects, improved limitless contexts and gigabytes of file storage. ← ~GroupWise on the iPhone? In addition to looking for coupons, if you see a product on the shelf that looks interesting or if it truly is from a manufacturer you’ve never ever heard of, mark the name down on your grocery list (as well as any contact info) and check out their web-site if you get home. You don’t need to invest in the item to get the information off of it. Then if they send you out a coupon, you possibly can use it towards your initial purchase.